Ladies and gentlemen… Boys and girls… Roll up! Roll up! Tumble down to Eureka! to celebrate 250 years since the creation of the CIRCUS! Opening on Saturday 10 February celebrate Circus250 this half term with two weeks of thrills and spills. Eureka! will play host to professional circus performers every day, showcasing a mix of shows, demos and interactive circus skills to mark 250 years since the Circus was created, right here in the UK. PLUS, they’re opening early at 9.30am on weekdays during our half term event, so get there early to avoid the longest queues! The Eureka! 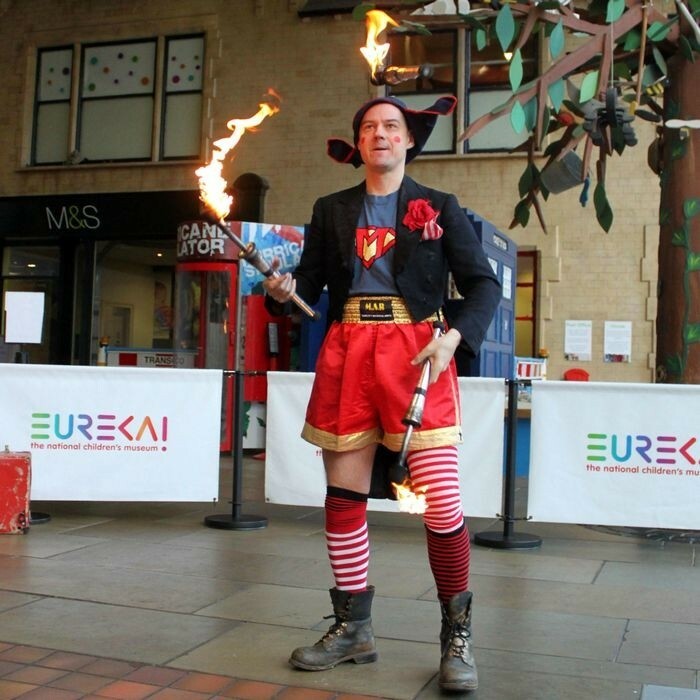 ringmaster and street performers will be out and about performing circus tricks to entertain all ages, or families can try their hands at juggling, stilt-walking and other circus skills! From 12–23 February be astounded, amazed and amused by the fire-eating, knife-juggling, pun-wielding wonder that is The Great Mandavi. Don’t miss the ‘Walk of Death’ finale to this awe-inspiring show. Then on 10-11 & 24-25 February Circus Sensible will be bringing their interactive show to the Little Big Top. Audience participation, comedy, circus skills and unadulterated silliness guaranteed. Circus Showtime activities are included in the price of standard admission or free to Eureka! Annual Pass holders.